Believability: Do you have it? The world we live in is chaotic. A great leader learns how to leverage chaos into creativity, to bring a sense of tranquillity to a crazy world. Dealing with new technology, profit expectations, continual new-product development, the fickle shopper, and global competitors requires perpetual change and lightning-fast reactions. Markets change, old competitors consolidate, new competitors emerge, and attempts at re-engineering threaten our daily bread. Both leaders and employees can soon feel under siege and at the mercy of chaos. A creative, energy-filled calm is what we need. A word picture may aid our understanding of this. Imagine you are a surfer. There you are with your board, waiting for the “big one.” If you are in Hawaii, the waves you are playing in might rise to twenty feet. All around you is surging, frothy chaos. Currents, tides, and the weather have combined to create a uniquely unstable environment. Conditions are always changing; every moment the ocean is different. If you try to catch a wave exactly the way you did yesterday, you will take a hard fall. You must stay alert and react quickly to every nuance of water, tide, and wind. 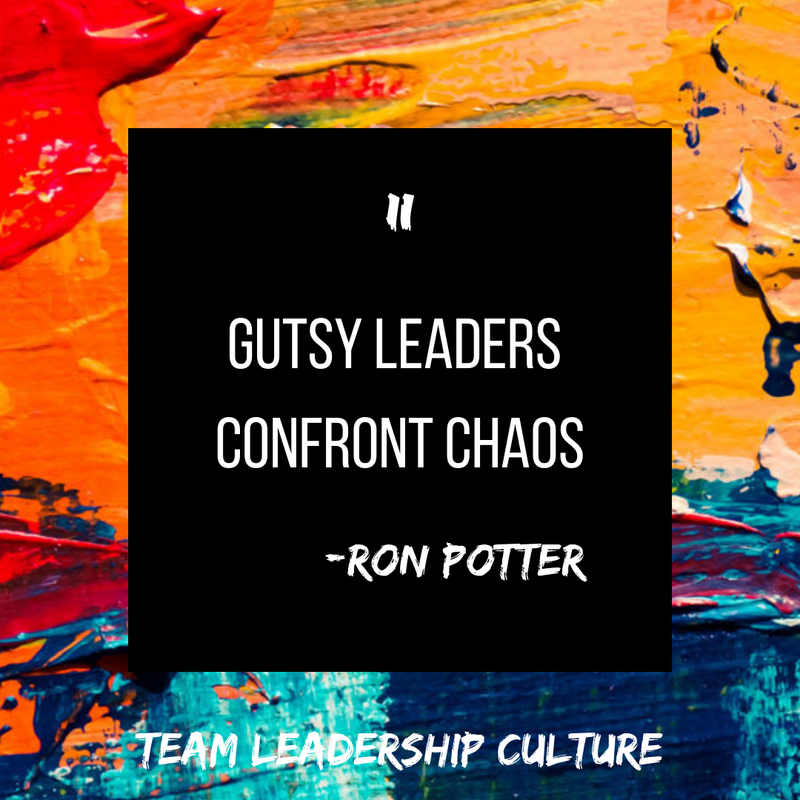 Gutsy leaders confront chaos. No one who is content to just paddle a surfboard beyond where the waves break has ever caught a “big one.” Neither has such a person ever wiped out. If you want to ride a wave, you have to enter into the chaos. If you panic while riding a big wave, you are sure to wipe out. If you stay calm, you can have a wonderful ride while tons of water crash down around you. Creating calm in the office requires a similar ability to assess the environment, to act quickly, and to stay calm. The economy, products, competitors, consumers, and employees all constantly change. Someone has to have answers; someone must be an independent thinker, able to calmly think things through. I am familiar with a banker who had a client ready to sell a branch location of his business. The main location seemed to be prospering, but this particular branch appeared to be a drain on energy, time, and resources. The business owner was upset, but the banker remained calm. He took the time to analyze the underlying causes of the owner’s problems. He visited the location, recast the numbers, and advised the owner not to sell the branch but to move and resurrect it. In reality, the branch location was producing extra cash, and the owner, following the banker’s advice, turned his entire business around. People will follow leaders who stay steady in the chaotic times and work with them to create new answers, new plans, and a new future. Do you know any leaders who intentionally start “fires” so they can get the “red lights flashing and hear the sirens”? Leaders in one of my client organizations proudly described themselves as “firefighters.” They were proud of the fact that they were good at hosing down crises. But when they were asked, “Is it possible you might also be arsonists?” it caused a great deal of reflection within the company. The goal is a creative, steady productivity—not a chaotic environment that squanders energy and resources on crisis management.